StaffCounter Agent is a program that monitors the activity of users on a Mac computer, designed especially for the StaffCounter time-tracking service. It helps to supervise employees and how they work at the computer. it takes screenshots at specified intervals or when certain words are typed. it allows you to track the user’s navigation through files and folders locally on the computer and on the network. First, you need to allow the launching of the programs, downloaded from anywhere. Open System Preferences, Security&Privacy, General. Unlock the window and select Anywhere in the group of Allow apps downloaded from. 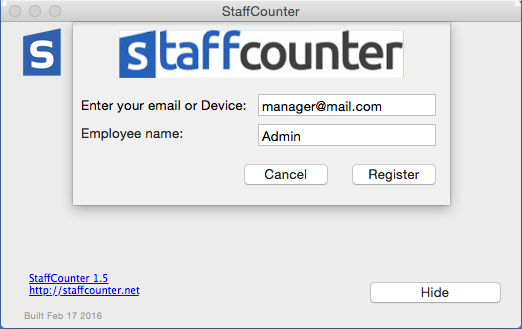 Download StaffCounter Agent on the Mac computer that the employee will use. Unzip the file into a new folder. Inside the archive you can find the embedded archive, which you also have to unzip. 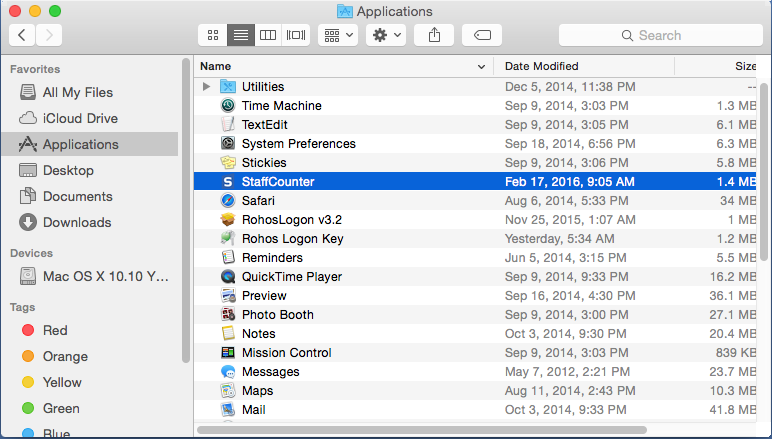 Move StaffCounter.app into Applications folder. Launch it by double-click. Allow the application access to user’s contacts. Write into the first field the email address of the manager(e-mail address, you used on registration). Write the name of the user into the second field. Click Register. Provide administrative password, if the system requires. To pause or stop the monitoring, use StaffCounter icon from the upper Taskbar. Yes, he or she can. Even without administrator rights, a worker can open the program and stop monitoring. However, after a reboot StaffCounter will automatically start up again. Removing StaffCounter Agent. All steps must be done from administrator system account.